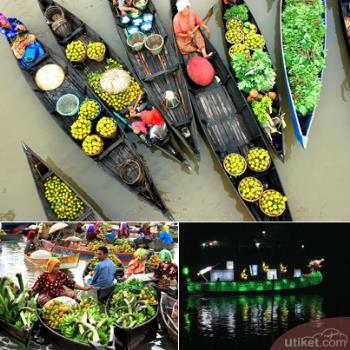 Floating Market Cultural Festival is a regular festival held every year in Banjarmasin, South Kalimantan. The festival is usually held in mid- ear for more than three days. It is usually held at Jalan Sudirman and Martapura River. This festival is quite famous. Not only from Kalimantan, there are even people from other islands willing to come to witness this festival. During this festival, the public could see the tourist and tanglung boats as well as more than 250 pieces of small wooden boats often called as Jukung. Jukung is a small wooden boat commonly used by floating market traders along the Barito River and Martapura River. The festival includes various activities, including Traditional Rowing Competition, Culinary Festival, Floating Market, Cultural Art Performances, Kampung Banjar and Ornamented Jukung and Tanglung Competition. Traditional Rowing Competition is a rowing race for local communities relying on speed. Local people are quite excited to be able to see this race. While in culinary festival, the public will be served a variety of delicious culinary specialties from Banjar, such as soto Banjar, grilled fish, Kandangan ketupat and various typical Banjar cakes. Not only that, hundreds of Floating Market traders in Martapura River also help to enliven this festival . Various of arts and cultural attractions such as Balogo, Madihin, Sinoman Haderah and some traditional dances also help to enliven this annual festival. There are also various traditional dances outside of Kalimantan region such as dances from Minang, Java, Bali, Ambon even Manado featured in this show, though. Meanwhile in Kampung Banjar event, the public can see and get to know the culture and Banjar customs crafts of thirteen districts and cities in South Kalimantan. Ornamented Jukung and Tanglung Competition is the most eagerly awaited event by the public. In this event there will be shown dozens Jukung decorated with various beautiful ornaments on Martapura River. This event certainly adds excitement of the Floating Market Cultural Festival . One cultural festival that should always be maintained and preserved. At the end of the event, it will usually be closed directly by the Governor of South Kalimantan. On that occasion, there will be displayed Banjar folk songs, Malay dance and inland dance, announcement and awarding winners of all competitions. This festival is quite interesting and aims to make the tourists both local and foreign to be more familiar with Floating Market, a typical South Kalimantan market where merchants use jungkung or small wooden boats to sell goods.